We're in the process of cleaning up, painting, and moving into our new house. SO exciting! One thing that has come up with moving into a new neighborhood is figuring out how to best introduce ourselves and get to know our neighbors (not always the easiest and least awkward thing in the world!). He thinks that we should go door to door and say hello, I say we meet them as we see them outside. I wouldn't want to be showing up at a bad time or have them feel like we're invading their space. 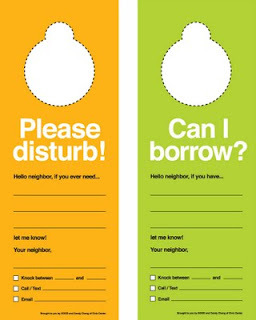 I saw these door hangers online today and they seem like a cute, simple way to say hello without invading. Then, we can let them know when they can stop by if they're free because the invitation is open to them. You can find the PDF download, so you can say a little hello to your neighbors, and the insight into how they were created on Candy Chang's website!